The first is the hulking brown bear in the room. 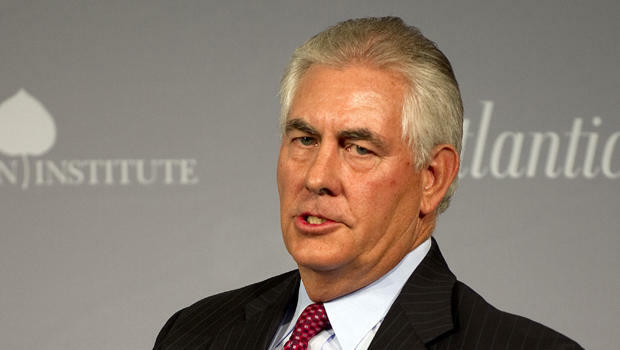 Tillerson, who developed his company’s joint venture with Russian state oil company Rosneft, has closer ties to Vladimir Putin than many other American figures in either the public sector or the private sector. That’s just a fact, and it’s not necessarily disqualifying. Just last week, I applauded Terry Branstad’s nomination as the next ambassador to China precisely because Branstad has worked with Chinese president Xi Jinping in the past, and his nomination could soothe feelings in Beijing. Just as the Obama administration worked with Moscow on the Iran nuclear deal and Syrian chemical weapons, the next administration will have to find ways to work with Moscow where common ground exists. But Trump didn’t spend an entire presidential campaign cooing over Xi Jinping. To the contrary, Trump has repeatedly evinced a quirky admiration for Putin and a sympathy for Russia at odds with human rights and freedoms that, until Trump, were are the heart of ‘American values,’ or at least what policymakers ascribe to American values. Even this weekend, as CIA sources briefed that Russian cyberattacks played a pivotal role in the presidential election, and as a bipartisan consensus emerged about the cybersecurity threat from Russia, Trump refused to countenance any Russian hacking at all. Of course, it doesn’t stop there. There are Trump’s potentially sketchy business dealings with Russia. His campaign manager through the summer, Paul Manafort, became so toxic that he left the campaign because of the role he played (and payments he took) boosting the pro-Russian former president of Ukraine, Viktor Yanukovych. At a convention where the Trump campaign showed little interest in the Republican platform, it nevertheless intervened to weaken the party’s stand on a democratic and free Ukraine. At one point last summer, Trump even invited Russia to hack into Hillary Clinton’s email accounts. Without entering the domain of conspiracy theories (no, Russian hackers didn’t fix the voting machines in Wisconsin and Michigan to Trump’s favor), suffice it to say that Trump, for whatever reason, has consistently taken a softer line on Russia than any major presidential candidate since Henry Wallace in 1948. Tillerson’s proximity to the Russian regime adds an air of menace to his candidacy at State, whether warranted or not, because of Trump’s bizarre behavior on Russia. That’s probably not fair to Tillerson, who is far more than just ‘a businessman who’s worked with Putin.’ But symbols and signals matter. The second issue is that Tillerson has no experience in government or public diplomacy. Had Trump chosen a national security advisor or deputy national security advisor with any real experience in formulating foreign policy, Tillerson’s nomination would be far less risky. Instead, he will join a national security team that is unprecedentedly inexperienced, all of whom will be working for a president who himself has no military or government experience. If, instead of Michael Flynn and KT McFarland, someone like Stephen Hadley or Robert Zoellick were in the West Wing, Tillerson’s nomination would be far less troubling (and possibly even refreshing). Tillerson would reassure no one outside the United States (except perhaps Russia) that the Trump administration is up to the task of perpetuating American global leadership. For all his flaws, Mitt Romney is a well-known figure, and leaders across the globe recognize in him the qualities you would associate with an elder statesman — calm, measured, reliable. The same goes for former Utah governor Jon Huntsman, who speaks Chinese and served as ambassador to China in the first two years of the Obama administration. Reports also speculate that Trump is likely to nominate John Bolton as deputy secretary of state, but it would be far better for Bolton to serve as secretary of state outright. You may disagree vehemently with Bolton (as I do) on the Iran deal, and you may believe he’s a throwback to Bush-era neoconservatism (though Bolton never quite fit in that bucket, and he’s far more nuanced than the popular Bolton caricature suggests). But no one would seriously believe Bolton willing or capable of compromising American values over a short-term and naive swoon toward Russia. Ultimately, neither Tillerson nor Bolton may wind up in Foggy Bottom. With a slight 10-9 Republican majority on the US Senate foreign relations committee, a single Republican dissenter and united Democratic opposition could stall either nomination. Rand Paul, the non-interventionist and libertarian senator from Kentucky, has spoken out strongly against Bolton. Marco Rubio, the hawkish senator from Florida who like Paul, once ran against Trump for the presidential nomination, could oppose Tillerson (with the full backing of figures like John McCain and Lindsey Graham). So might Jeff Flake, the senator from Arizona, a longtime vocal critic Trump and a key Republican supporter of the Obama administration’s efforts on both Iran and Cuba. Meanwhile, with just over five weeks to go until inauguration day, and with Trump picking fights with Beijing via Twitter and cable news appearances, the world is watching nervously as the president-elect stages a public version of Celebrity Apprentice to choose his administration’s top diplomat. So far, at least, no one seems incredibly reassured. You mean, besides Obama of course. Mr. “the 1980s want their foreign policy back” has not exactly been a bulldog of anti-Russian activity or rhetoric, and certainly did not campaign as hard on Russia. I guess the Podesta Group’s ties to Russia and Saudi Arabia weren’t much of a concern. After all, everything that Democrats do is for the good of the people right? The left used to love Russia, and deep down they still do. I don’t know why anyone would say they didn’t like the left, because Obama & Hillary bent over and grabbed their (c)ankles for them repeatedly. Tillerson has more experience in dealing with foreign governments IN PLAIN LANGUAGE than any US diplomat in the last 70 years. Let’s put diplo-speak to rest permanently. Could the author just add one sentence to this article: Did the author support the “naive swoon toward Russia” that was so highly acclaimed when Obama and Clinton were doing it a few years ago? The tired “invited the Russians to hack Hillary Clinton’s emails” thing is already an exhibit of ignorance, you need something to make up for it. Maybe we should have taken Trump “seriously” and not “literally” when he made his statement about Russia. But both Bush and Obama were initially naive about Russia, generally, and about Putin in particular, that’s absolutely true. (And you don’t have to believe that Russia is the chief geopolitical foe of the United States, even now, to believe that Obama and Clinton also botched relations with Russia).